What does effective networking look like? Find folks on LinkedIn who work for Company ABC and connect with them on a professional level. Exchange ideas, generate topics of discussion that demonstrate your expertise in subjects that may be important to your industry or profession. Connect with people in a business or trade association for your industry or profession; attend local chapter meetings, conferences, give a presentation, write an article or paper for a peer-reviewed journal: establish yourself as an expert. Be the first person to help someone else in your growing network with a referral or job lead; be seen as a resource first. There are three ways by which you enter the hiring process: as an external candidate, as a referral candidate, or as an internal candidate. In my experience, internal candidates generally enjoy the biggest advantage, followed closely by referral candidates, and then external candidates a distant third. Somewhere between 33 and 67 percent of jobs found and filled are through personal referrals. Through personal referrals, much of the uncertainty in the hiring process is reduced or eliminated altogether from the equation, which leads to a higher probability of getting a job offer (and more quickly). It is also a low-cost recruitment tool. You simply must be strategic in designing and building your professional networks to increase the probably of being referred for an open position. 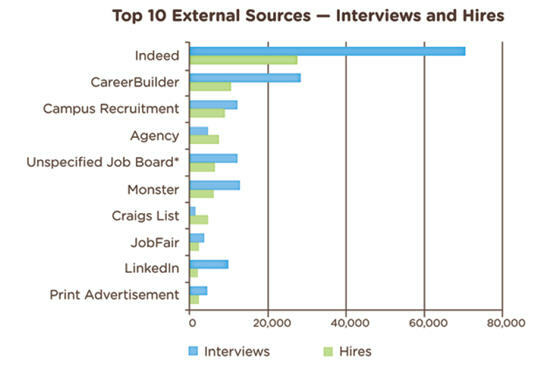 The chart below is from a report at http://www.silkroad.com listing the top 10 external sources for interviews and hires. Another reason employee referrals are the preferred entry method to jobs is because the average length of employment is greater with referrals than the other two methods for entering the hiring process, as the following chart reveals. Good question, Karl…I hope that helps, and go Red Sox!